Since I don’t know many people who enjoy seeing summer end, I use the words “gently waft” instead of “fall” for this post. What better way to mark—not celebrate—the end of summer than with a beautiful work of art celebrating the major splendor of fall: Nature. So many artists who often exist under the radar, and so little time… Elizabeth Boott was the wife of the Dark Impressionist painter Frank Duveneck (1848–1919). Her paintings are beautiful, especially her nature paintings and landscapes. They don’t have all that Baroque-inspired tenebrism of her husband, but the delicacy of her work really is a beautiful counterpoint to her tragically premature death. 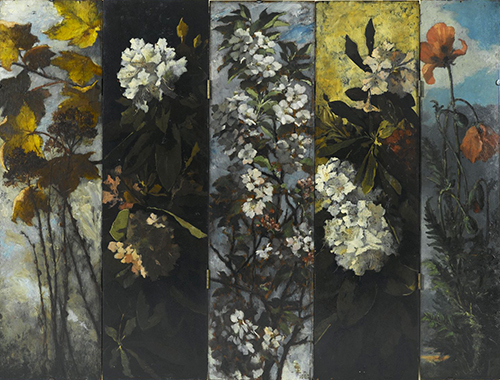 Being a woman of independent means from a wealthy Boston family, Lizzie Boott Duveneck was able to pursue seriously a profession as a painter. She initially trained under William Morris Hunt (1824–1879), an American Barbizon painter—a group of painters who emulated the realist landscape paintings of the French Barbizon painters near Fontainebleau outside of Paris. Barbizon painting emphasized authenticity in depictions of nature, and ambient light gleaned often from painting outdoors, a radical new practice. Hunt had begun the first ever classes for women artists in Boston in 1868. She then trained with the Barbizon landscapist Thomas Couture (1815–1879) in Paris, and briefly with her future husband Frank Duveneck in Munich. The relationship between Duveneck and Boott lasted for most of a decade. Boott convinced Duveneck to move to Florence, where she lived with her father, and encouraged him to try to enter works in the official Salon in Paris. I think she actually managed to get Duveneck to lighten his palette from his Dark Impressionist style seen in his Munich paintings of the 1870s, particularly portraits. Lizzie’s style was light struck, delicate, and celebratory of nature. 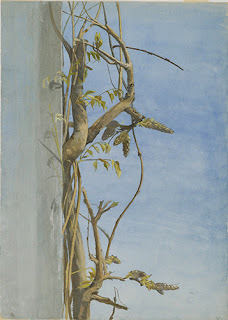 Although her first show of oils was in Boston, she also exhibited in Florence and Paris, particularly her watercolors. Here is the complete set of panels, probably meant for decoration in dining or drawing room door panels. Duveneck’s isolated flower paintings remind me of the work of Fidelia Bridges (1834–1923), another Massachusetts native trained in the same realist vein. Bridges painted in the influence of the American Pre-Raphaelites who were fanatical about accurate detail in depictions of nature. Her work is a little less lyrical than Lizzie’s. There’s something very monumental and classical about her work. 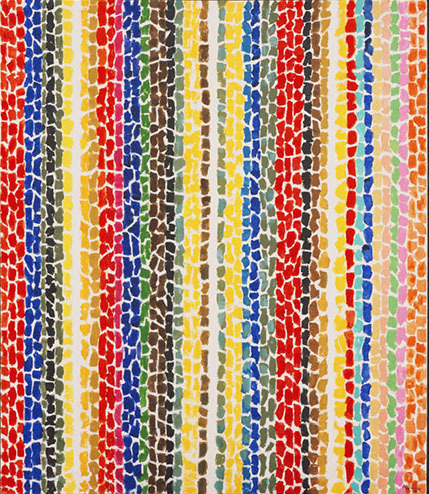 I’m also including in this ode to autumn Alma Thomas, not because she’s underappreciated, but because I love her colors. Also, I think she has a fascinating history: in 1924 she was the first woman to graduate from Howard University’s new major in art; she taught art in grade school in Washington, DC for 35 years; she went from photo realism to abstraction in her late 50s; and she only started seriously exhibiting her work in her 70s! 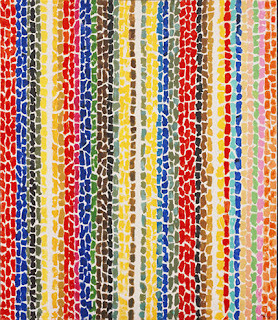 She went through the color field painting style briefly under the influence of then-current Abstract Expressionism. However, her fascination with nature—particularly the leaves rustling in the window outside her windows—led her to her mosaic-style color field paintings that are absolutely the hallmark of her work.